Carotene from carrots, Vitamin C, Vitamin A and antioxidants are keeping your skin, hair and nails healthy by protecting skin from sun damage, preventing premature wrinkling, removing blemishes, maintaining skin elasticity, improving hair thickness and by get rid of several scars. Potassium from carrots is keeping your skin hydrated. 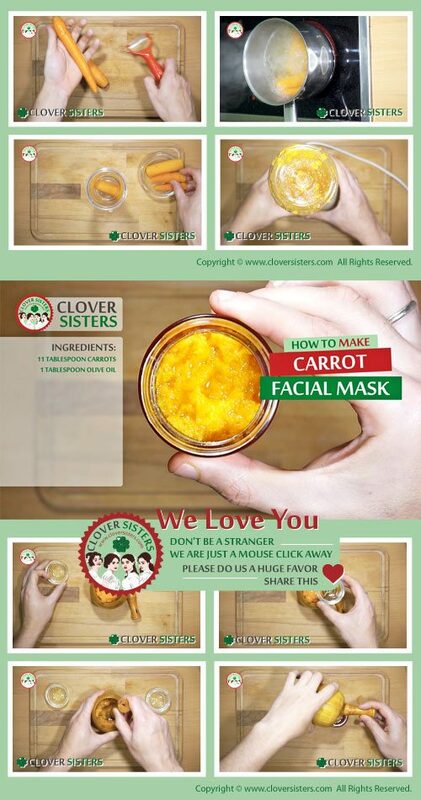 Eating carrots is helpful, but you can make a face mask for oily skin from carrots juice and honey or mix it with milk cream for wrinkles or with coconut oil for dry skin. If your hair is dry or brittle, chances are your need more carrots in your diet. Carrots play vital role in the hair growth because they are rich in vitamins and minerals, and if you drink carrot juice daily you can see instant results in hair growth and texture. Because beta-carotene, carrots can be extremely beneficial for patients healing from any type of wound. Drink freshly pressed juice of carrots or placing carrot pulp on open wounds are two ways to use carrots in order to heal wounds. First one serves as a nutrition source and the second one help heal and prevent infection. Mash cooked carrots and add the olive oil to make a paste. Apply on the face for about 10 minutes, 3 times a week.